Made from a careful blending of Extra Virgin Olive Oils of the Mediterranean Basin directly selected by Pietro Coricelli for their particular characteristics, such as taste, delicate perfume and full body. Product of Italy. 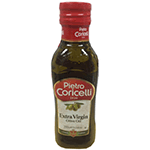 As a condiment for vegetables, meat, fish and other recipes that require a delicate dressing.